Two matters determine whether an account of young adulthood is interesting. Firstly, the management of expectations. A problem for YA, understood as genre, is that the narrative of self-discovery is fixed at either end. (How many examples could be unearthed where the protagonist ends up none the wiser for their choices.) Authors feel compelled to seed their tales with instructive force, then disguise the medicine with strong flavours. It sometimes descends to a display of street cred, copiously researched. Or too busily studded with eccentricities of character and event. Secondly, perspective. For the young themselves there is all the stress and stately pace of the lived process. Do they really need to supplement that with store-bought anxiety? For adults on the other hand a tale of youth must work hard to maintain engagement – in the deepest sense, we know how it ends. Vikki Wakefield achieves distinction with her characters by keeping them real, by blunting the instructive edge of her tales. Friday Brown is the young, independent character at the heart of her latest novel. She leaves a wealthy home after her mother’s death, moves to a big city, lives in a squat amidst a network of young toughs. She is illuminated by the usual strategies – her struggles, betrayals and hard won perceptions – but emerges with grain and grit. Perversely the lack of explanation around major decisions – such as leaving home in the opening pages – is the mysterious engine of Friday’s reality. These necessary silences drive our interest, binding details in a life-like texture. Moreover the development we witness is not goal-oriented. A maturity is gained away from the swagger and delusions of youth, towards adult conditions of seasoned wariness and self-knowledge. Age brings fewer convictions, not more. A key motif of her development is the idea of curse. When we meet her, she considers herself the focus of unseen power, believes that water will be her undoing. Five generations of Brown women before her have drowned. It seems her mother might defy the curse with a prosaic death from cancer. But a curse lives by freely carving events to the shape of prediction. Her mother’s lungs fill with water – pneumonia – and the curse claims another. The argument for curse persists through the novel and seems poised to survive it. It loses force not by the failure of prediction but by Friday’s growth beyond a primitive belief in directing powers of all sorts. If she comes to realise she is not cursed, she comes also to reject a world that brings forth what was meant to be. Another trajectory is friendship, or the selection of human influences. A virtual index of Friday’s growth, the character Arden is first encountered as vibrant inspiration, then slides through stages to a dull study in murderous self-absorption. The novel concludes with Friday rendering the honour due to a truer friend: the departed, enigmatic Silence. There is sadness in the spectacle of her small, careful observance, but also in another mark of age. Beyond the grand imaginings of youth, the significance we may wish for ourselves and our actions, the best to be hoped is a brave, noble or generous act and the recognition it receives in a friend. 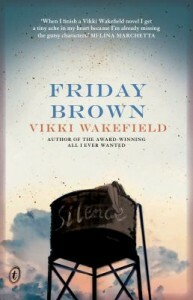 This entry was posted in Fiction, Recommended Reading and tagged book review, books, Friday Brown, Parramatta City Library, reading, Vikki Wakefield, Writer by admin. Bookmark the permalink.